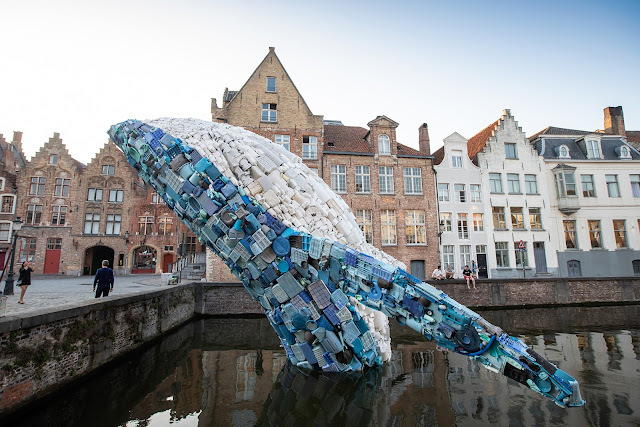 This Is Colossal – "A 38-Foot-Tall Whale Made From 10,000 Pounds of Plastic Waste Surfaces in Bruges"
"The studio, led by Jason Klimoski and Lesley Chang, wanted to address how cities from across the globe are contributing to the waste that has piled up in our oceans—the discarded plastic that is washing up on our shores and endangering and killing marine life. “Right now there is 150 million tons of plastic swimming in the ocean, our oceans, the oceans we share,” says Klimoski in a video created about the project. “Pound for pound that is more plastic waste swimming in the ocean than there is whales. So an opportunity like this to show the type of plastic and the amount of plastic that ends up in our oceans is really important.”"